Rainbow Lewisia is a cultivar of a succulent-like plant that is not among the easiest plants to grow in the yard. Learn how to overcome this challenge, why the plant is worth growing, and what the plant has to do with a famous event in U.S. history. Botanists classify Lewisia as an evergreen perennial. It's in the purslane family, as is the weed, common purslane, and the annual popular as a bedding plant in dry areas, portulaca. The waxy, sword-shaped leaves grow in rosettes and are leathery to the touch. While this foliage is an asset, the plant is primarily grown for its pastel flowers, which bloom in April, May, and June. By buying the Rainbow Mix, you can have some combination of salmon, orange, pink, rose, and yellow flowers. Often, if you look closely at the petals, you'll see that they have white stripes. 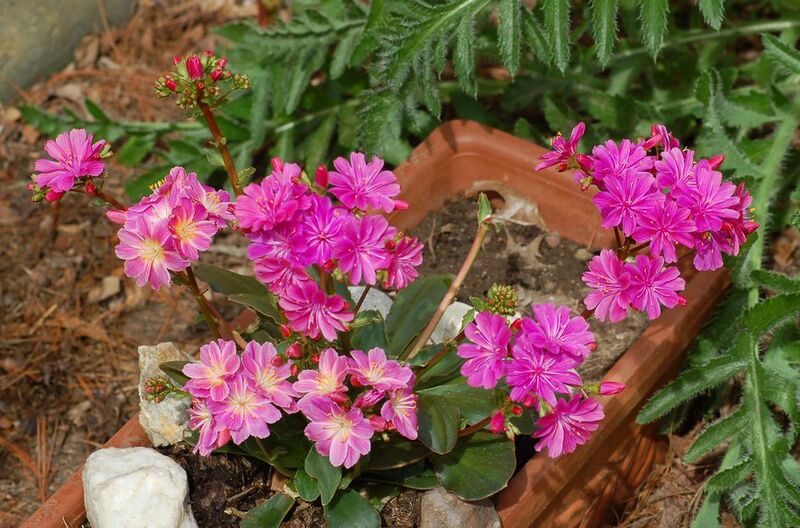 Some Lewisia plants have flowers that are altogether white. The flowers bloom in clusters atop long, fleshy stalks (from ground level to the flower tops, the plants stand about 8 inches tall). The plants can spread by having a "mother plant" send out babies (what horticulturists term "offsets") directly from itself. Lewisia is a North American native indigenous to several western states of the U.S. and to British Columbia in Canada. Recommended planting zones are 5 to 8. It prefers a soil pH that is acidic to neutral. Locate these perennials in full sun in the North (they can profit from some shade in the South) and give them a soil that drains well (sandy or pebbly soils work best). Having ground that drains sharply is very important, because crown rot is a pervasive problem with Lewisia, especially in cold weather. Its susceptibility to crown rot also means it's critical to ensure that the crown sits above ground level when you install the plant in the ground. Its habitat in the wild is scree, so it thrives in poor soils and makes a good rock garden plant. You can further provide the drainage this perennial so craves by applying a gravel mulch around it. Some gardeners who grow the plant in a container set the pot on its side during the winter to avoid any buildup of excessive moisture around the crown. In terms of pest-control measures to take, you may have to kill slugs if you notice holes being chewed in the leaves. After blooming, deadhead to foster further flowering. You can also gain more plants after flowering is over as you would with hens and chicks, separating the babies from the mother plant and transplanting them. Although they're considered drought-tolerant perennials, it's still a good idea to provide them with water during hot weather (especially while they're flowering) if you're growing them in a sunny location. L. rediviva is the state flower of Montana. The indigenous peoples had both culinary and medicinal uses for it. L. longipetala ("long-petaled") was hybridized with L. cotyledon, a union that resulted in the cultivar, Little Plum. The genus name of Lewisia comes from American explorer, Meriwether Lewis. Lewis and Clark encountered Lewisia rediviva on the famous expedition (1803 to 1806) they undertook at the behest of President Thomas Jefferson and brought back specimens. Frederick Pursh, a botanist, is responsible for the name. Pursh also established the genus, Clarkia in honor of the other famous explorer in the duo, William Clark. Jefferson had a great interest in botany. A genus is named for him, as well: Jeffersonia. Think of Lewisia, Clarkia, and Jeffersonia as the all-American plant trio. The reason why a common name for Lewisia is bitterroot (other common names are Siskiyou Lewisia and cliff maids) is that, although the root of L. rediviva is edible, it's very bitter until it's been cooked thoroughly. The plant gave its name to Montana's Bitterroot Mountains, Bitterroot River, and Bitterroot Valley.